Making your own Pumpkin or Apple Pie Spice is super inexpensive compared to buying those premixed little jars! Just like any "convenience" foods, the pre-made mixed spices are expensive! I don't know if you can see in the picture above, but those jars were marked down on sale for $2.99 each. The regular price was almost $5.00 each! $6-10 worth of spices into two tiny little jars is ridiculous considering that more than likely you already have the spices in your cupboard! So, what I recommend is making your own. The next time you empty a spice jar or two wash them out and premake your own Pumpkin or Apple Pie Spice. Want to know what the difference is between the two? Ginger. 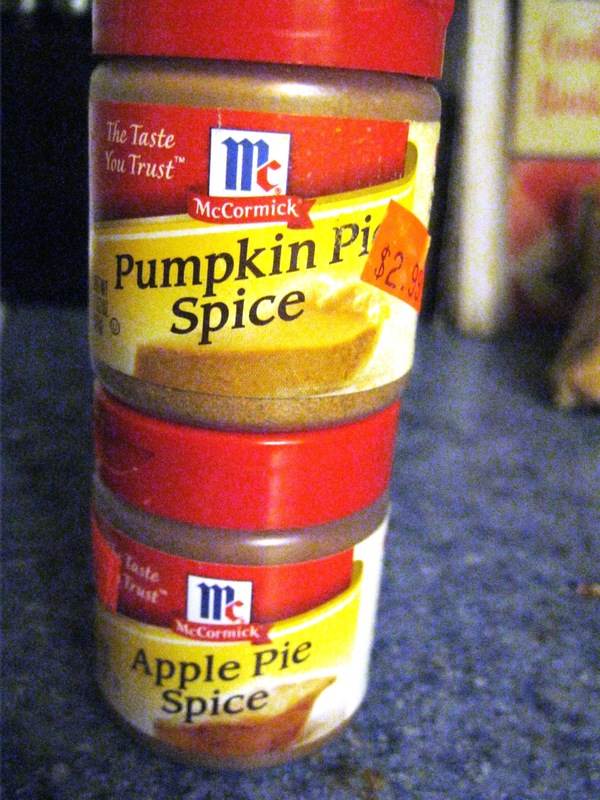 Pumpkin Pie Spice has Ginger, and Apple does not. Optional: ground cloves 1-2 tsp. Optional: ground cardamom 1/2 tsp. Jen's Tip (Jan's daughter): Sprinkle pumpkin or apple pie spice (instead of plain ol' cinnamon) onto your applesauce to make it a little more interesting! very smart I got those when we were in the states then when I actually thought about it I figured it was a huge cost. Thanks Sue, you are always so sweet! What great recipes to have! Thank you very much. This is a great one to pin so you can pop over and find it for the like one time a year that you want the spice, but you don't want to pay for it at the store! Thanks Dianna! Thanks for the recipe. I am going to pin this too! Cheers. Hi Jan, I’m Anne from Life on the Funny Farm (http://annesfunnyfarm.blogspot.com), and I’m visiting from Farmgirl Friday. Brilliant. Never thought of making my own spices before, but now that you've posted about it, I'm like, duh! Makes a lot of sense. Pinning this -- I have all the individual spices and this would be so easy! Thanks so much for sharing on Busy Monday!